When you're using CauseVox, you might be working with several other people in your organization across several campaigns. For example, let's say you're an Executive Director running a campaign. Your communications staff, your accountant, and your IT person all may need to have access to the your CauseVox campaign for setup and operations. 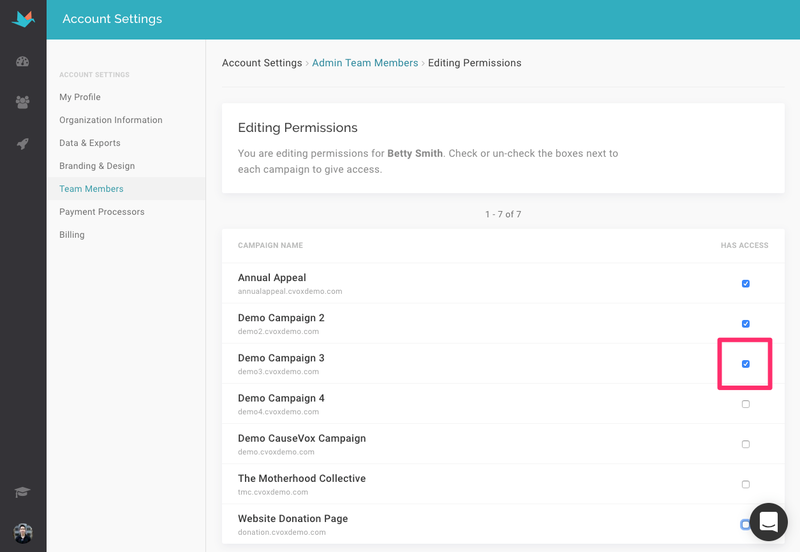 You can invite Admin Team Members to be able to modify your campaign site. 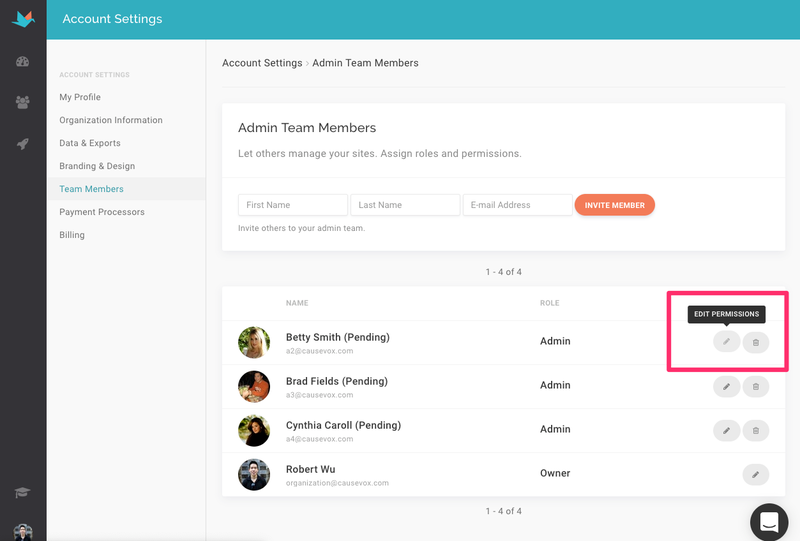 These Admin Team Members will be able to access the admin side of your CauseVox campaign site and make modifications. Click on "Team Members" in the dropdown menu on the upper right corner of your screen. 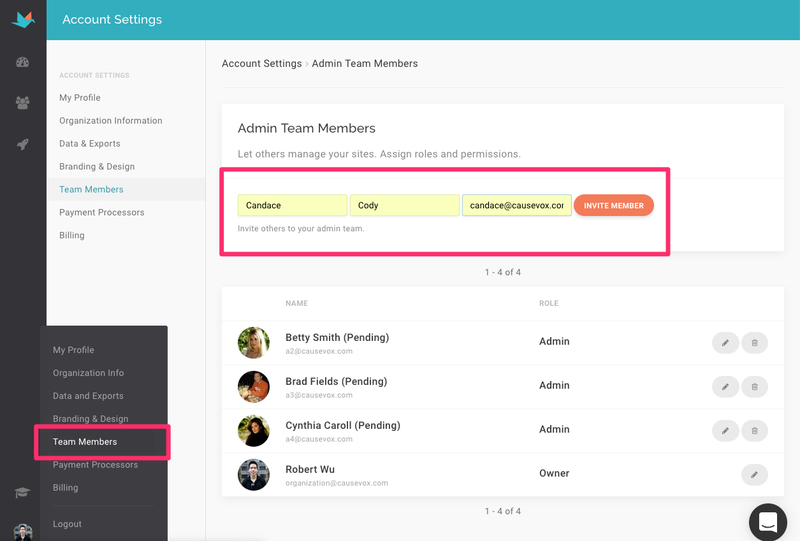 Invite a Team Member by putting in the Team Member's first name, last name, and email address. They will be sent an email from CauseVox about getting access to the campaign site. Select the "Edit Permissions" pencil icon next to the admin team member's name. Find the campaign you'd like them to have access to and check the corresponding checkbox. This will be autosaved, confirmed when the green "Permissions Updated" message appears. Note: they can change anything on the campaign, but won't be able to change Organization Info, Billing, or Add Team Members. More more info, see our blog post on Admin Team Members.